The last chapter dealt with applications related to plant and environmental monitoring approaches. The next two projects use these kinds of monitoring techniques for expressing their artistic statement. 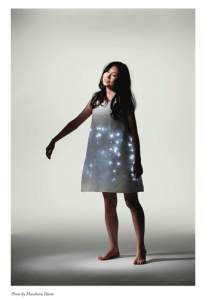 The Japanese artist Hill Hiroki Kobayashi developed a wearable bio-acoustic clothing [Kob2010]. The “Wearable Forest” (2009) enables bio-acoustical interaction with the subtropical forest of the southern Ryukyu Islands of Japan. Embedded LEDs, speakers and a microphone provide an audio-visual experience for the wearer and the people around him. The clothing acts as a peephole to the far-off natural environment. The omnipresent and continuous audio-visual output of the clothing enhances the awareness to this natural landscape. At best, people will pay more attention and behave more carefully towards it, because of the continuous connection provided by the cloth. Apart from environmental monitoring, Laura Beloff explores the possibilities of monitoring human physiological symptoms within urban and green environments [BeBeHa2013]. 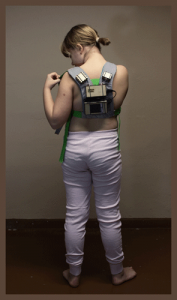 Her artwork “Evidence” (2012) is a wearable electronic device that records measurements of human stress (e.g. pulse and galvanic skin resistance). The measurements are combined with geographical (GPS) data. In context of the quantified self-movement, the recorded data is open and accessible for every kind of data analysis. The data recording intends to reveal the potential healing qualities of green environments for humans. The interaction between a plant and its environment is limited. For this reason, it is a real challenge for the plant to survive. The plant tries to adapt to its environment and places its seeds at the best new places. Exactly, this challenge of finding a new location for the seeds is the topic of the PlayStation game "Flower" (2009). The player controls the wind forces that influence actively the flying behaviour of a flower petal. More flower petals are gathered when the main flower petal flies nearby other flower petals. A bigger amount of various flower petals colorize the natural environment. The game itself has no enemies, no points to gain or collect, and time limits. The visual and musical experience is intended to cause an overall emotional feeling. The game designers of “Flower” use the human’s positive and emotional connection to plants [Chamovitz2013, p. 171] for their research on the human mental state “Flow” in Games [Csikszentmihalyi2008]. A playful exploration of digital plant growth and its generated soundscape is the result of the iOS application “Flowerium” (2011). The user releases seeds via touch interactions on the screen. When the seeds are colliding with the ground, the plant starts growing and a sound is played simultaneously. During the blossom cycle, the plants exchange their genes in certain conditions. The new mutated plants are represented by a new blossom appearance. This new blossom are stored in the application`s blossom library. “Flowerium” can be used as an entertainment or as digital picture for decorating an interior environment. Beyond the playful experience of “Flowerium”, the new blossoms are created by an algorithm that simulates a genetic behaviour of the flowers. Computer scientists and visual programmers are inspired by these visual structures of plants. Especially, the documentation of Ernst Haeckel [Haeckel2004] and René Binet [Binet2007] are frequently referenced in this context. In computer vision Lindenmayer-System is a very well-known algorithm for generating tree like structures and was described by Prusinkiewicz and Molt [PruMo1990]. The computer generated trees are very often used for visualizations in architecture or in games [DeuLin2005]. Furthermore, voronoi diagrams are a very common tool for versatile structures of a plant (e.g. a leaf). The University of Calgary runs a special “Biological Modelling and Visualization” research group that explores these emerging forms and patterns in plants. The artwork “Interactive Plant Growing” (1992) by Christa Sommerer and Laurent Mignonneau does not only mimic a static image rendering of a plant, it explored the capability of a computer generated plant growth animation in an interactive art context [StSoMi2009, pages 40-45]. Growth can be an important parameter for algorithmic driven visualization techniques. For instance, the artwork “Decorative Growth Pattern” (2008) by Allison Kudla shows an extraordinary usage of the parameter growth [Myers2012]. She combined incorporeal medium digital vector images with the corporeal structure of a leaf. A laser cutter translates the digital geometric patterns to the physical world. The leaf takes over the role of the physical material, which is afterwards placed in a petri dish with nutrients. After some time, the nutrient caused morphological changes in the pattern structure of the leaf. The result of this growing process is a new collection of geometric patterns based on the interactions between digital geometric patterns and the natural cell morphology. Many generative art projects use random behaviour to create new patterns. This randomness approach is commonly simulated by a computer, but Allison Kudla applied randomness that is performed by a natural process. Especially, this involvement of a natural cellular process within a generative artwork makes her artwork “Decorative Growth Pattern” so unique in this field. The mimicry of plant processes does not only exist in computer vision applications, it also emerges in the domain of robotic applications. The research project “Infotropism” (2004) mimics plant growth towards light sources [HoKeWaFo2004]. The alignment of the robotic plants informs people about the different usage of the recycle trash compared to the general garbage. Jie Qi and Eunice Lin from the MIT High-Low Tech group applied the special bending “SMA mechanic” (2012) to their own paper sculptures. They created robotic paper leaves and blossoms sculptures that open and close, like a real leaf or blossom. Matthew Gardiner is fascinated about blossoms, too. His combination of origami techniques and robotics is perfectly transformed to a robotic blossom with its own emotional appearance. The blossom opens and closes like a real blossom. Additionally, his “Oribotic” (2010) lights up for an emotional expression [Ars2011]. The interactive robotic installation “Growing, Raining Tree” (since 2000) reacts on stimuli of its environment. If people come close to its water pool, the robotic tree tries to greet the people by mimicking moving branches. Moreover, the tree can also react on different light conditions, which is presented in various mood stages of the tree. The different behaviours of the tree references to the existing responsive natural landscape we live in. 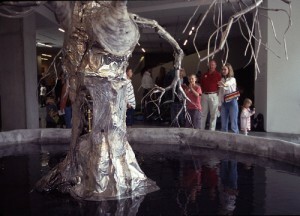 Interactive robotic installation “Growing, Raining Tree” (2003) was originally a part of the “The Amorphic Landscape” exhibition by MacMurtrie and Amorphic Robot Works since 2000. All this robotic projects have an emotional component in common. The designers and artists try very hard to remove the artificial look and feel of a robot by adding well-known natural behaviours. The limited movements and more simple structure of a plant seem to be very appropriate for them. Biomimicry is a very common approach for designers and engineers. The field of biotechnology and bio art does not want to mimic a natural process. They want to use plants and add new features to them. For instance, bio artist Laura Cinti had been experimenting with genetic engineering. She introduced keratin genes into the cells of cacti. The result was a cactus, which had hair instead of thorns [Cinti2011]. Genetic modifications of plants are a very common procedure for biochemists. Janet Braam and her research group investigate the TCH genes of the plant Arabidopsis. Particularly, they are interested in visualizing the biochemical and physiological functions of the TCH products. Their motivation is to reveal the mechanism of plant’s signals. For this reason, they enabled the Arabidopsis to glow on areas, where it has been touched. This additional function is more meant to understand how the biochemistry of plant works, although it is also very interesting for Human Plant Interfaces (e.g. touch biosensing applications). Ultra-light sensitive cameras can track these touches like infra-red tracking systems (e.g. TUIO) usually do. A group of DIY Bio hackers implemented successfully a crowd funding campaign for their developed “Glowing Plant” (2013) project. They promised their backers to create a plant, which can light up without any electricity. The success of their crowd funding campaign pushed again media attention to the hard discussed topic about genetically-modified organisms (GMOs). Kickstarter reacted on this discussion and banned all other GMO projects from their platform. The risk for the society and the backers are too uncertain from their point of view. The anxiety about the “Glowing Plant” project reveals which new possibilities could be enabled by biotechnology. On the other side, it also addresses the unknown danger for our natural ecosystem through GMOs. In the future, bio artists, biochemists, and botanists have to transform the emotional discussion about GMOs to rational dialogs. The real danger and the real benefits of current biotechnology have to be assigned before it will be possible to use biotechnology beyond a lab environment. The list of artworks shows a spectrum of disciplines that got inspired by the living organism plant. These inspirations were expressed in a broad range of forms and shapes. It is not possible to classify and determine all these artistic works in the scope of this thesis. Even less, the goal of this chapter was not to provide a complete summary of works beyond plant displays, biosensing applications and so on. The objective of this chapter was a summary that presented an outline of different plant oriented approaches. It showed how the different disciplines got inspired by plants and which functions they adapted for their concepts. In this context this chapter fulfilled the purpose of delivering an inspiration for future projects in these different domains and beyond them. [Haeckel2004] Haeckel, Ernst (1904). Art Forms in Nature. Prestel, 2004. [Binet2007] Binet, René (1901). Natur und Kunst. Prestel, 2007. [PruMo1990] Prusinkiewicz, Przemyslaw; Molt, Walter (1990). The Algorithmic Beauty of Plants (The Virtual Laboratory). Springer, 1990. [DeuLin2005] Deussen, Oliver; Lintermann Bernd (2005). Digital Design of Nature: Computer Generated Plants and Organics. Springer, 2005. [StSoMi2009] Stocker, Sommerer, Mignonneau. Christa Sommerer & Laurent Mignonneau (2009.) Interactive Art Research. Springer Verlag, 2009. [Myers2012] Myers, William (2012). Bio Design: Nature + Science + Creativity. The Museum of Modern Art, 2012. [HoKeWaFo2004] David Holstius, John Kembel, Amy Hurst, Peng-Hui Wan, and Jodi Forlizzi. 2004. Infotropism: living and robotic plants as interactive displays. In Proceedings of the 5th conference on Designing interactive systems: processes, practices, methods, and techniques (DIS '04). ACM, New York, NY, USA, 215-221. [Cinti2011] Cinti, Laura (2011). The sensorial invisibility of plants: an interdisciplinary inquiry through bio art and plant neurobiology. Doctoral thesis, UCL (University College London), UK. Boland, Howard (2013). Art from Synthetic Biolog. PHD Thesis, The University of Westminster, UK. [Csikszentmihalyi2008] Csikszentmihalyi, Mihaly (2008). Flow: The Psychology of Optimal Experience. Harper Perennial Modern Classics, 2008. The EU-funded research project Plantoid is a great example how plants (specially plant roots) inspired scientists developing new robotic applications. A kind of a good Biomimicry example related to plants. David Benqué questions with his genetically engineered sound garden installation Acoustic Botany (2010) our opinions about biotechnology. Furthermore, he demonstrates how biotechnology can be intergrated and used for artistic expressions. The tutorial Blooming Zoetrope Sculptures by John Edmark illustrates very nice how the Fibonacci numbers and their experience in plant structures can be used for artistic sculptures (3D Printing) and animations (video art). Especially, for the above mentioned topic Algorithmic generated patterns this methods enables new opportunities of an artistic expression. Biotechnology and its approach of genetic manipulations gets more and more attention in the art/design domain. Jon Bruner published an online article on O’Reilly Radar in which he stated Biology as the next hardware – Why DNA is on the horizon of the design world. In that relation the DIY/BIO Newsletter BioCoder looks very promising. In addition to the other mentioned biotech project above, the research experiment Fluorescent Flowers (2014) by Katsutomo Sasaki, Ko Kato, Hiroshi Mishima et. all. demonstrates how plants can be manipulated for a glow functionality. Due to the green movement, architects explore more and more the advantages of plants. For instance the project plant-e (since 2009) found a method to produce electricity through the plant cycle. Their approach can be applied to roof tops in urban environments,beside the streets and so on. The technology is available at their Webshop as a DIY Packages for Students, Artists and Tinkerers. The Biotech/Bioart project Silk Leaf (2014) by Julian Melchiorri investigated the positive outcomes of leaves. He was able to develop a synthetic biological leaf, which can absorb water and carbon dioxide to produce oxygen. The leaves can be used for big walls or other surfaces. The installation Waldprotokolle (2015) by Florian Mehnert utilizes a forest to encourage a public discussion about the current surveillance disclosures. In his installation he surveilled and recorded the sounds of a local forest area with microphones (similiar to the above mentioned project “Wearable Forest“). Later, the spectators of the installation can listen and observing the ongoing interactions in this area. The artists intentions are calling attention to the endangerments of surveillance activities. uniMorph (2015) is a technology for rapid prototyping fabrication of customized thin-film, which can change its shape like a leaf. This technique can be applied for robotic applications or others. It was developed by the MIT Tangible Media Group and Felix Heibeck, Basheer Tome and Clark Della Silva with supervision from Hiroshi Ishii. As already described frequently in my thesis, plants are a vital construction resource for human kind. Some artists explored the re-building process of electronic devices with plants. The device Magnetoceptia (2015) by Dewi de Vree and Patrizia Ruthensteiner can sense electro-magnetic activity and transforms it to an audible output. Their different antenna shapes are built of tree sticks and copper wire. Plants and funghis share a symbiotic ecological life. Slime and Mould are the connections between these living organisms and built the infrastructure for this big natural communication network of plants. The EU funded research project Physarum Chip (2013-2016) investigates this phenomenon with the objective to build a biotechnology based computer out of this material. The project Drone Garden (2014) by Martin Reiche utilizes the metaphor of a garden for his electronic sculpture. Each microcontroller represents a plant, which fight via network activities for resources to grow and gain power. A creative application online article describes the project intentions very good. How a forest is likely experienced by its animals can be perceived at the interactive Virtual Reality installation In the Eyes of the Animal (2015) by Marshmallow Laser Feast exhibited at the AND Festival. Augmented Ecology tracks developments in an emerging branch of the anthropocene; the intertwining of data and media systems with ecosystems. The installation Moss Table (2011) by Carlos Peralta, Alex Driver and Paolo Bombelli – exhibited a the Alive exhibition – demonstrates the application of Biophotovoltaic technology in an art context very nice. In the future, those Low-cost BPV devices might be the power source for small Internet of Things applications. Nowadays they produce enough electricity for power up a digital clock. The Computer Game The Botanist (2016) by James Biddulph deals with the positive impacts a plant has on human life. The game designer goal was to bring people together with this gardening game. That goal is pretty related to community gardens and also kinda related to garden therapy. The game has almost no limitations for the user. The intention was surely to provide a very nice flow experience similiar the game Flower (mentioned above). Meissner, Irene; Möller, Eberhard (2015). Frei Otto – forschen, bauen, inspirieren. Edition Detail, 2015. Finsterwalder, Rudolf (2015). Form Follows Nature: A History of Nature as Model for Design in Engineering, Architecture and Art. Birkhäuser; 2nd Edition, 2015. Dorota Orlof and others produced a very nice game design for Formicarium (2014). The game is a strategy game and has the aim to understand the ecosystem of ants and plants better. Scientist work a technology to bring electronic circuits inside of plants. Around farming the website Farm OS looks very promising. farmOS is a web-based application for farm management, planning, and record keeping. Another platform is ePlant, which is a comprehensive Data Visualization Tool for Plant Biologists. Beyond that, it holds some value for Generative Art, Biomimicry inspired Industrial Design, and some system bahvior description. Navlakha, Saket, and Ziv Bar-Joseph. “Algorithms in Nature: The Convergence of Systems Biology and Computational Thinking.” Molecular Systems Biology 7 (2011): 546. PMC. Web. 25 Dec. 2017. Leaf Notes (2018) by Matt Deslauries – An Interactive Web Toy with generative drawn leaves.